Adam Epstein brings a conversational, offhand delivery to a neurologically-enhanced gumshoe named Nick Stavrianos in Quarantine. 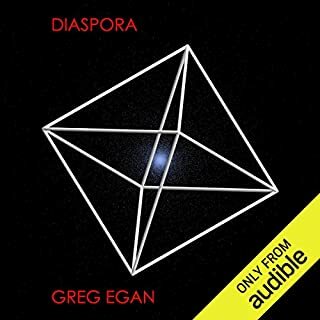 Greg Egan’s science-fiction novel is set in the year 2067 in a world where the solar system has been enclosed by an unbreakable barrier put in place by an unknown extraterrestrial force. Andrews is hired to find a brain-damaged woman named Laura Andrews, who has disappeared from her institution. Following her to Hong Kong, Stavriano’s case leads him closer to the mysterious force that’s "quarantined" the solar system. Epstein performs Stavriano’s narration in a world-weary tone, his voice modulating in his nuanced renditions of the story’s many characters. In 2067, Nick Stavrianos is hired to investigate the disappearance of a mentally disabled woman, Laura Andrews, from the institution where she was being cared for. Aided by a skull full of neural modifications, he follows her trail to the Republic of New Hong Kong, where an organization known as the Ensemble has uncovered Laura’s extraordinary secret: An ability that could transform the world. 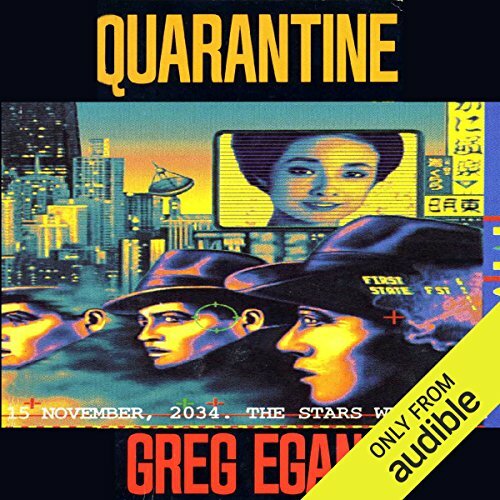 ©2013 Greg Egan (P)2013 Audible, Inc.
Where does Quarantine rank among all the audiobooks you’ve listened to so far? In terms of narration, the worst so far. The great ideas, like the priming, quantum mechanics, behavioral mods, and the quarantining of earth. The first part of the book, before it got into the quantum mechanics side of it, really reminded me of the Ghost in the Shell universe. Would you be willing to try another one of Adam Epstein’s performances? 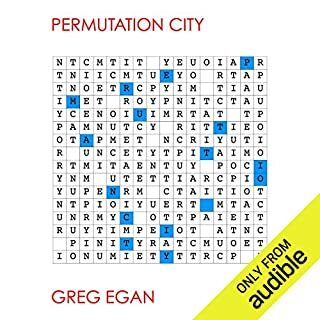 Yes, but only as I'm a Greg Egan fan, and no other option sadly. Not so much moving, but the lead character's discussing the behavior mods as a means of avoiding grief, and rationale behind it, on humans having always strived for behavioral modification, and a hardware mechanism of doing it being no less valid. Another great book killed by narrators pacing. Stop sabotaging your books by pacing the narrators. The third wall is broken with every pause... every over enunciated... halting... word. I've forgotten the beginning of the sentence by the time narration reaches the end. 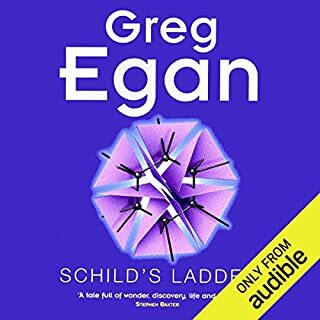 I gave up listening to the audio version after 10 minutes.The reader tried a poor hard boiled detective style. His patronising attempt at Chinese accent was woeful. I could not bear it. I read the paperback many years ago and will have to read this fascinating book again. What did you love best about Quarantine? 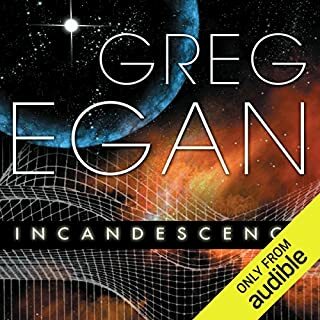 This story had a great concept, and the author did a great job of making a difficult subject comprehensible to the lay-person. I can't help but think this could explain some of the oddities in our world like the Mandela Effect. The level of technical detail was refreshing. Guessing what technology will be available in three to six decades is always difficult, but some sci-fi authors are surprisingly good at predicting how technology will evolve. Which character – as performed by Adam Epstein – was your favorite? The sky is the limit; literally. Cool tech, deep science, and mind blowing revelations. loved it, right up there with his best. Narrator is a bit deadpan. But works well with the sort of cyberpunk noir theme. Disappointed. The entire premise of the "bubble" was turned out to be a bait and switch after a promising opening. What the novel was presented as being about turned into hard sci-fi with a focus on quantum mechanics. Now I like hard sci-fi so that wouldn't necessarily be a problem but the author seem to struggle with the presentation. A big part of the book consists of bland characters just having monologues/dialogues. These lengthy sessions seem to have little more purpose than to provide the listener with enough of an understanding of the mechanics that will make the ending plausible. 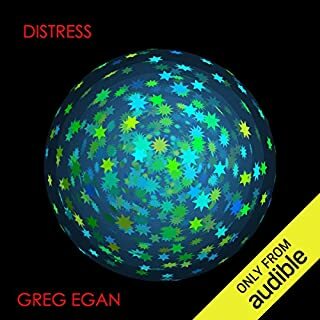 Quantum mechanics is not so pliable as simulated humanity - this ends up frustrating given Egan's level of detail and extrapolation. One of my favorite books, but the choice of narrator is unexplainable. The main character is Australian but the narrator is an American Sunbelt state burnt out dude-bro. So annoying and inappropriate I had to shut it off after 3 seconds. What other book might you compare Quarantine to and why? Adam Roberts' work comes to mind. What character would you cut from Quarantine? 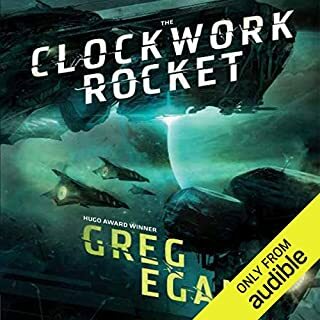 Whoever greenlighted this audio edition should be fired. A solid detective story with quantum mechanics at the core. Unfortunately the narration was grating, but worth enduring for the story.